Tuesday, February 12, 2019 - They say revenge is a meal best served cold and this lady did not only serve it cold but also without chills. After her best friend betrayed her and went ahead and slept with her boyfriend, she hatched a plan to get even. She somehow managed to get close to her best friend now nemesis’ father and slept with him. 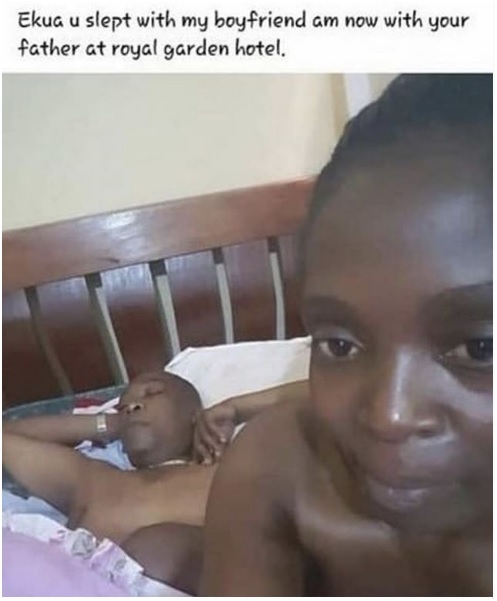 She even took photos of her and the old guy in bed in a hotel and shared them on social media and tagged the lady who slept with her boyfriend.